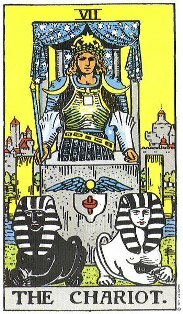 When I see the Chariot, the keyword for me is control… consciously directing the course, finding balance between the positive and negative forces of life. Upright tells me the quarrent is gaining control, navigating their own path, choosing the direction and speed they travel. Inverted, it tells me there NEEDS to be a gain of control, that the quarrent has been being pushed and pulled and directed by outside forces rather than by their own will. Upright, it indicates a certain maturity, a realization that we are responsible for our own outcomes. Inverted, it suggests there NEEDS to be the awareness that we are not victims of circumstance, but that we’ve created our own circumstance… and if we don’t like it, we need to regain control and create a new circumstance. Chariot can also indicate a complete change in direction, travel of some sort. Picture Julius Caesar riding his chariot triumphantly into Rome. He has defeated his enemies and conquered vast, new lands. This is the spirit of the Chariot. 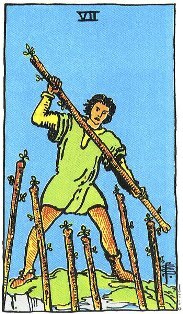 Card 7 represents the victories that are possible through willpower and self-mastery. A military image is appropriate for the Chariot because this card stands for the strengths associated with combat – discipline, grit, determination and assertiveness. The Chariot represents the positive aspects of the ego. A healthy ego is one that is strong and self-assured. It knows what it wants and how to get it. We can get annoyed at someone whose ego is too healthy, but we often turn to that person to lead us through difficult moments. We know he or she won’t be wishy-washy. Triumphal “car” (chariot), armored warrior, sun/moon symbols, lingam & yoni symbol (the encircled rod on the winged shield), black and white sphinxes/lions/horses, sometimes at rest. A canopy of stars and sometimes a throne inside the car. The Fool is close to completing what he set out to create long ago, back when the Magician revealed those tools to him. But enemies are now standing in his way, devious human enemies, bad circumstances, even confusion in his own mind. There’s no more forward momentum; he feels he is fighting just to stay where he is. Walking along the shore, watching the waves come in, he puzzles over how to defeat these enemies and get things moving forward once again. The chariot is one of the most complex cards to define. On its most basic level, it implies war, a struggle, and an eventual, hard-won victory; either over enemies, obstacles, nature, the beasts inside you, or to just get what you want. But there is a great deal more to it. 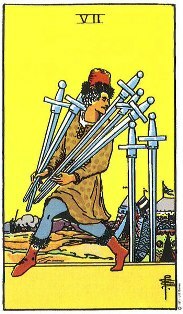 The charioteer wears emblems of the sun, yet the sign behind this card is Cancer, the moon. The chariot is all about motion, and yet it is often shown as stationary. The Chariot is a fascinating card, but also frustrating. Like the crab, it is armored, but also cut off – a charioteer fights alone. It moves from one plane to the next (water to land and back again) – conscious and unconscious, Earthly and spiritual. It succeeds by attacking from the side, rather than straight on. On the one hand, the Chariot indicates loyalty and faith and motivation; a conviction that will lead to victory no matter the odds. But the chariot can also signal a ruthless, diehard desire to win at any cost. The Querent should be reminded to save his energy for what comes after. Victory is just the start of things. The Chariot represents receptivity to the will of the one Source. The keyword attributed to this card is fence or enclosure, and its sense function is speech. Every word we speak is a fence enclosing an idea or thought. An eloquent vocabulary is a powerful tool for protection and preservation, as well as advancement. When we speak, we set in motion a vibration that acts upon the ethers, space and akasha. Blavatsky said, “Sound or speech is a tremendous force when directed by occult knowledge.” It is only when we become still, quiet and receptive that we can be victorious. Then the primal force can work through us. Symbolically, the Charioteer is the soul, directing the chariot, the body. Notice that the Charioteer has no reins. It is mentally, through the will, that he directs the sphinxes, the positive and negative senses, to draw the chariot along. The starry canopy overhead indicates that we are recipients of celestial energies. The waxing and waning moons depict time and rhythm, which are stages of the mind. This can be seen by their placement on the shoulders, ruled by Gemini, which is the first air sign, symbolizing the mind. The winged globe on the cart represents self-consciousness, elevated by aspiration. The disc with an upright rod through the center depicts the positive and negative forces joined in a working relationship. The square on the Charioteer’s breast indicates an orderly attitude, and his eight-paneled skirt decorated with talismans, represents the soul’s dominion over the material world. The message here is that through control of the senses, and elevation and purification of the desires, by the use of our own free will, we can achieve complete dominion while in the physical body. Astrological Correspondence: Moon (And Cancer). The Moon has four seven-day cycles, and since the earth was created on the sixth day, the Moon, a satellite of the earth, could not have come into manifestation until after the sixth day. With 7 as the end of a physical cycle, we can readily see why the Moon is assigned to this number. Cancer, the crab, rules this key, 7. The crab has a fence or shell which protects its soft body from the dangers of the outer world. During a 7 cycle, one is sequestered away from the world in some manner, as the crab, Cancer, withdraws into its protective shell to ponder recent experiences and examine them subconsciously (Moon). Number 7 people are quiet, introspective, analytical and very profound. They are the thinkers of the world, and are usually involved in some scientific, philosophical or metaphysical pursuit. Alone, they can mentally wander the universe, searching for the shell that will enclose their ideas with form and substance. I can see where a few adaptations in my understanding of this card would be appropriate. Although my definition was on track (no pun intended), I did not incorporate the concepts of battle and victory. I like the story of swimming parallel to the shore, diagnally. And two of these four sources specifically mentioned possible situations with a vehicle – either getting a new one or repairing an existing one. Considering that I wrote yesterday that my Jeep needs a bit of TLC, I think I’d better heed that warning and do what I can do to get it back in good running order. I can see where this card’s energy applies to me in the here and now, in a few different categories of my own life. It’ll be interesting to see which other cards join this one in today’s Daily Dose.